We’ve taken a few of our images and made them available, custom printed on demand from CafePress. 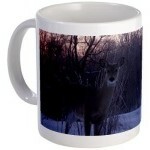 This mug would be a great gift for any deer hunting enthusiast. Visit our gift shop for hundreds of available items, with more to come.